Alumadock offers a complete line of commercial docks. Increase your slip revenues and protect your customer’s property by adding a heavy duty and high quality covered roofing system. Make your property ADA compliant and accessible to all customers by using our commercial gangways. 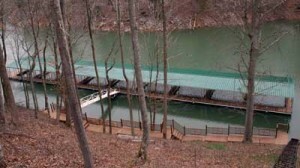 Alumadock is your one stop shop for commercial dock needs. Alumadock X9 commercial docks feature the same heavy wall 9.5″ channel as the residential X9 system. The interior of the dock utilizes our 5″ x 3″ tube as cross members and uses our 5″ x 1″ channel to form a structural truss in the dock to significantly increase the dock’s lateral load ability. Whether you’re mooring (100) 24′ or (10) 240′ boats, our commercial dock system can withstand the rigors and forces required to keep your customers’ property safe. Alumadock uses a proprietary roofing system for all commercial docks, utilizing the strongest and most attractive shapes and methods available. 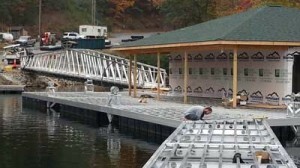 Commercial dock roofing systems typically call for higher eave heights, wider slip spans and smaller finger widths. All of these factors work against the strength of a normal residential dock. But with Alumadock’s commercial system, we have systematically designed every component to maintain the required strength while still allowing for commercial styling. We can offer a complete commercial system or match your existing styles. Looking for a new gangway to your existing commercial docks? 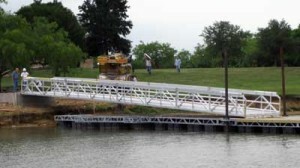 If your dock systems are still in good shape, consider adding one of our lightweight but heavy duty aluminum gangways. Alumadock commercial gangways are constructed with structural tubing using only 6000 series aluminum for maximum strength and corrosion resistance. Our system maximizes the allowable live load and spans, giving you the best gangway for your money.